This weeks Street Update is a Cinderella story. Not all to romantic but the imagery is as captivating as the original story of the Gebrüder Grimm. 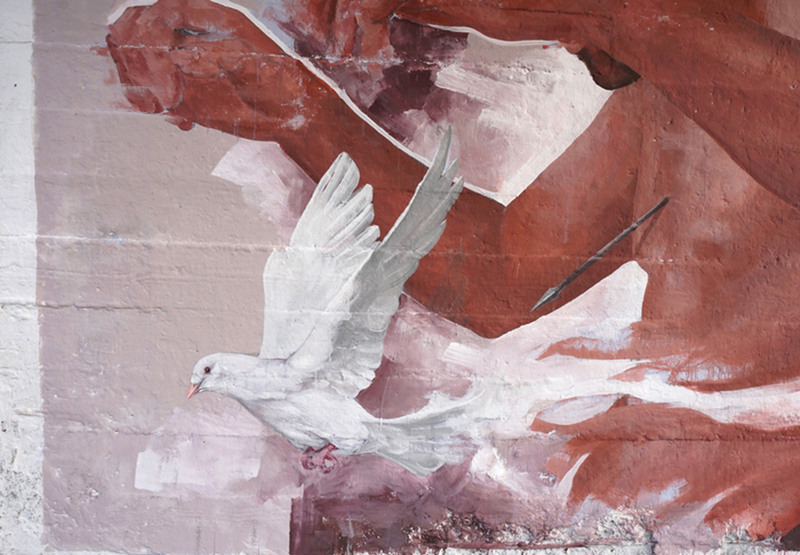 The color red and white doves take a prominent position in your selection of murals. 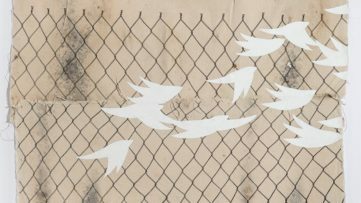 In New York two minimalists let white doves fly through blue walls; Another artists draws birds on the walls of the same city; the walls of Setobal are mud-red; blood pumping through muscles that lie open in Oaxaca; and in Lima a white dove slices a man in half. This all sounds very horrific but once you see the murals you might feel that our Cinderella story is romantic after all. 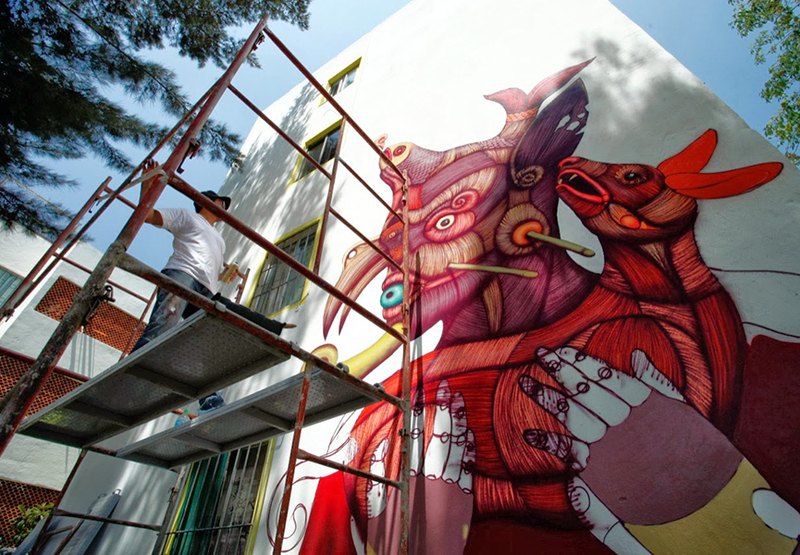 The Mexican street artist Sego Y Ovbal painted a new mural in Oaxaca, Mexico. The mural was organized by Mamutt Creativity. Sego painted the upper half of the murals with thin lines close to each other creating the impressions of muscle strands. The pullover (Ovbal) is painted with an ethnic, geometric pattern. The entire mural is shaded in red. The blood red creature carrying his dog. 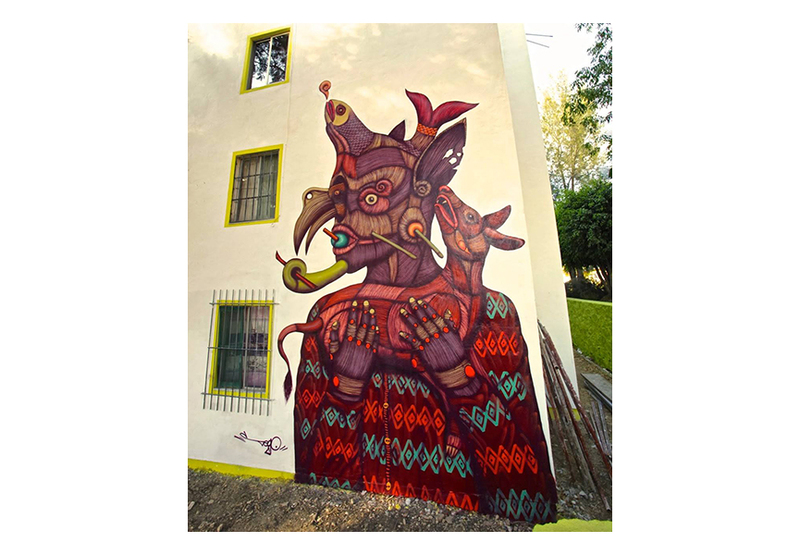 The Miami based artist Evoca1 participated in the Latido American Urban Art Festival. 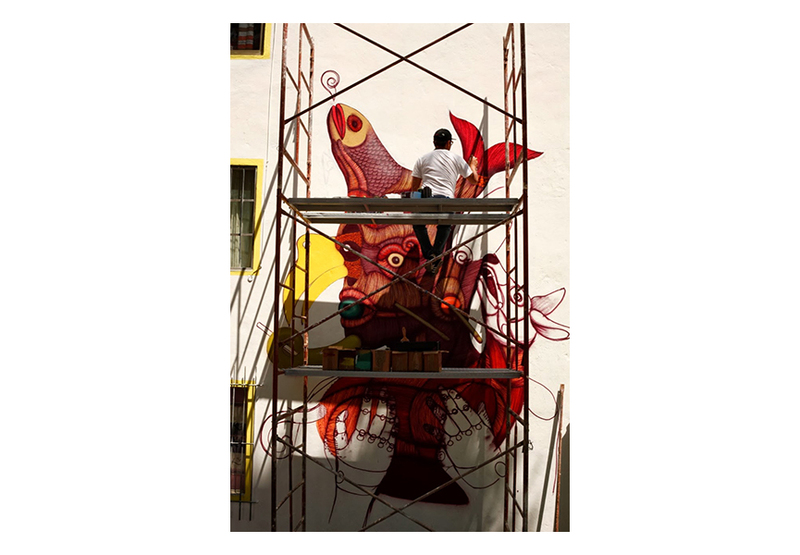 The festival organized for a group of artists to repaint walls in Lima, Peru. 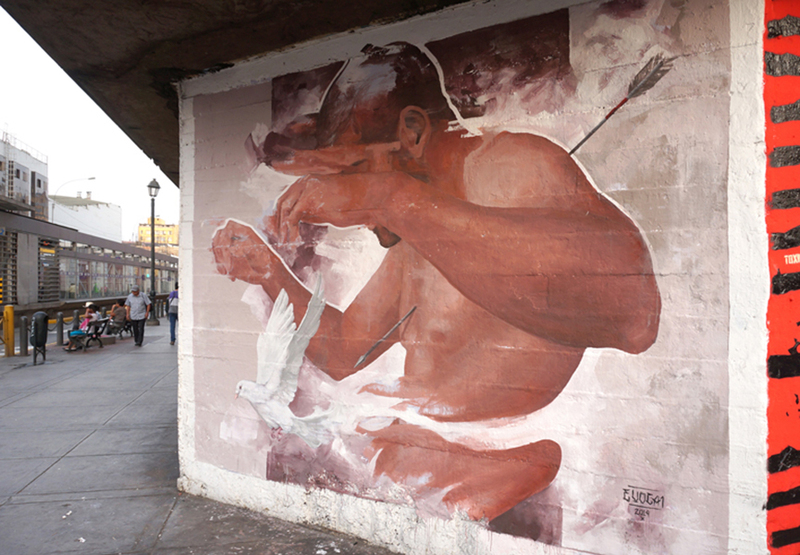 Evoca1 was one of the standout artists of the participants with the dove that is slicing the human torso. 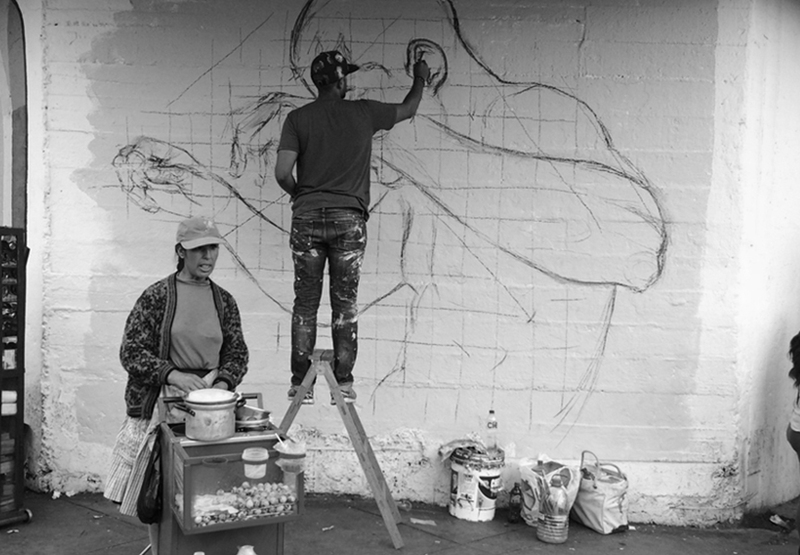 The artist first drew the outline on the wall and then began his work. 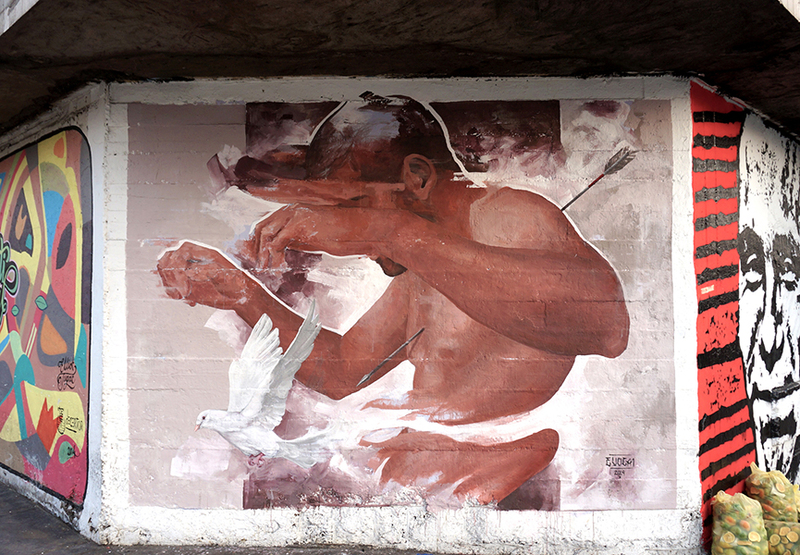 The torso is painted in brown creating a strong contrast to the white dove. The torso is pierced from the back by an arrow that is shooting towards the dove. 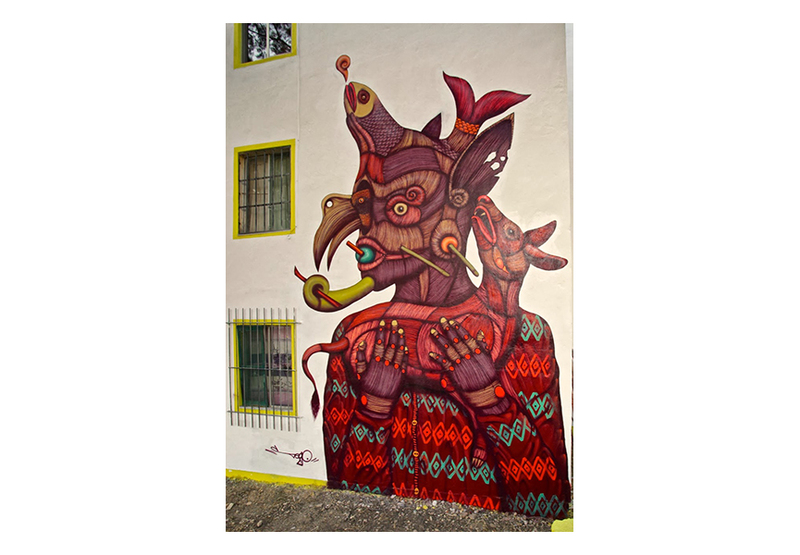 This mural shows the finesse and delicacy of Evoca1, a characteristic that is usually found in fine arts and not urban art. 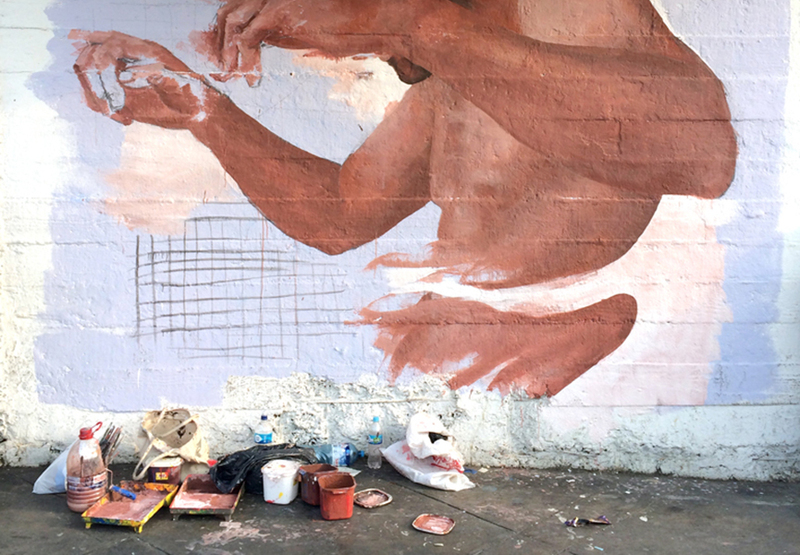 Evoca1 transfers these fine art skills to the street. 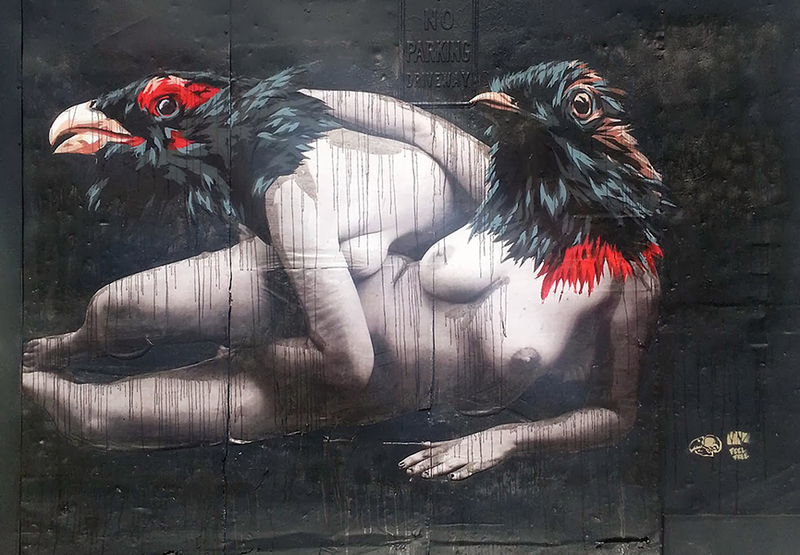 The Spanish street artist VinZ also spent time in New York during Scope. While there he painted a series of his signature hybrid humans with bird heads. The pieces are inspired by sculptures of old Italian Masters. 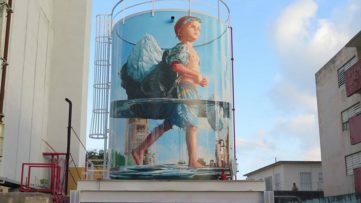 He included oil barrels to highlight the apparent dangers of gas fracking on the coasts of Ibiza and Valencia. 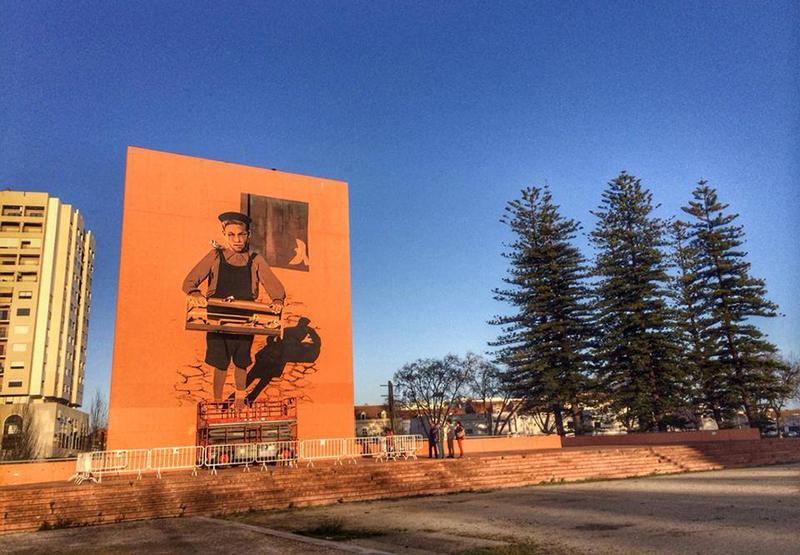 Odeith painted this huge mural in Setobal, Portugal. 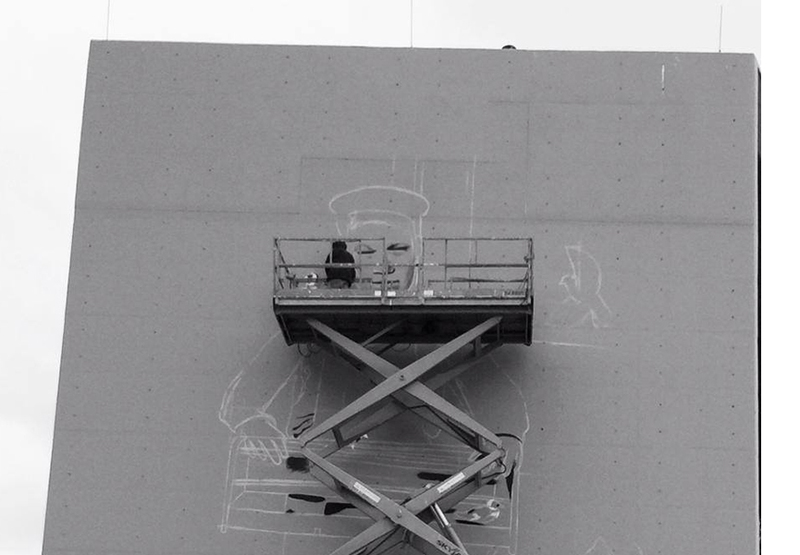 The piece covers the entire surface of a twenty-meter tall wall. The wall is coated in red-orange earth tones. Then Odeith unleashes is creative power on the wall. 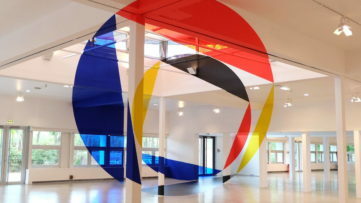 The artists varies between three different styles. All three styles carry the same trait: they’re three-dimensional. The plants hanging at the top right or growing from the bottom left are not real. Neither are the bird, boy, frame nor the sculpture graffiti. Odeith murals shows the artists versatilely and execution skills. 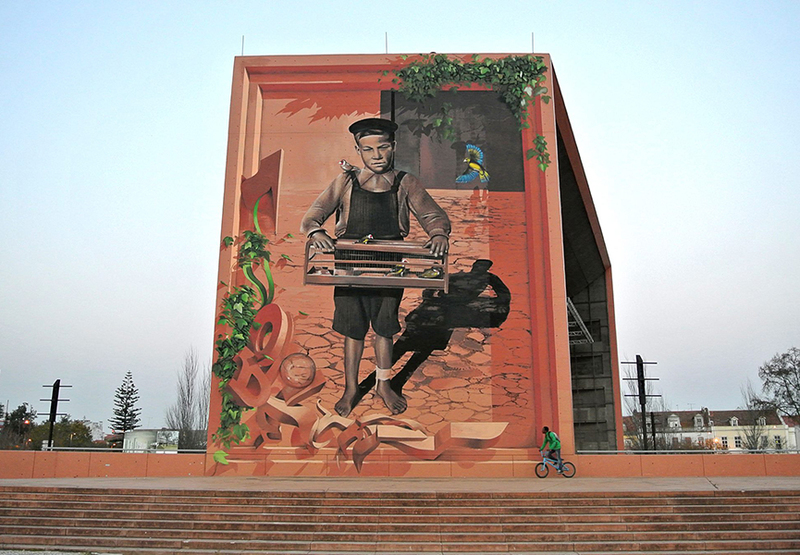 All styles (3-D graffiti, photorealistic painting and depth painting) are executed with great skill. The Israeli artist Know Hope presented his work at the Thinkspace exhibition during Scope in New York. 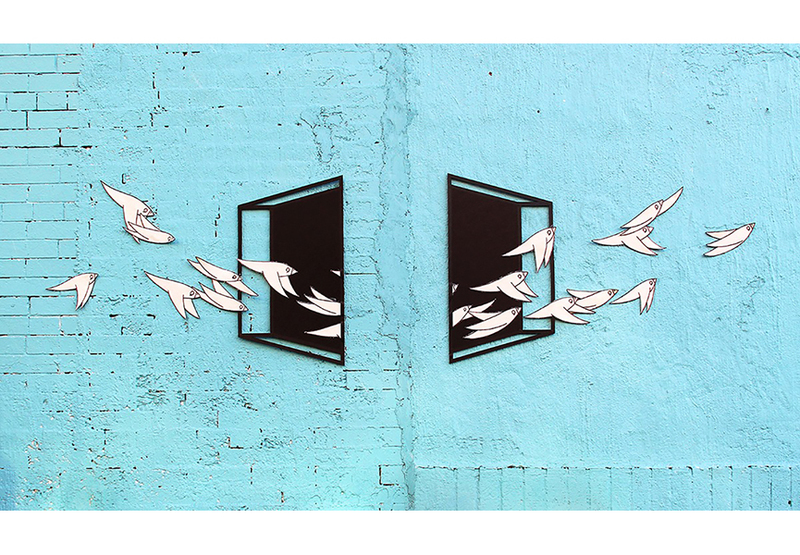 While there he collaborated with the New-York based artists Aakash Nihalani to create a beautifully minimalistic street art piece. Aakash Nihalani work consists of isometric rectangles and squares. Aakash’s painted and taped works play with the concept of depth and space and thus create a three dimensional illusion. 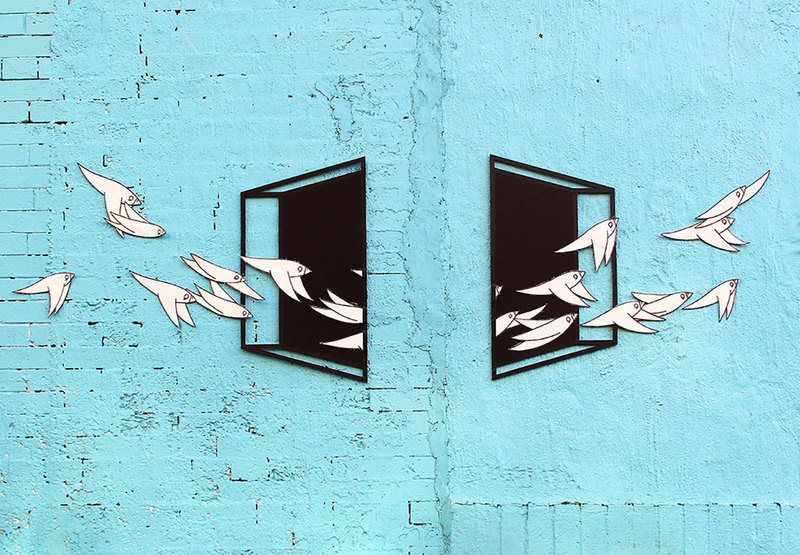 The artist selectively places his graphics around New York to highlight the unexpected contours and elegant geometry of his city. 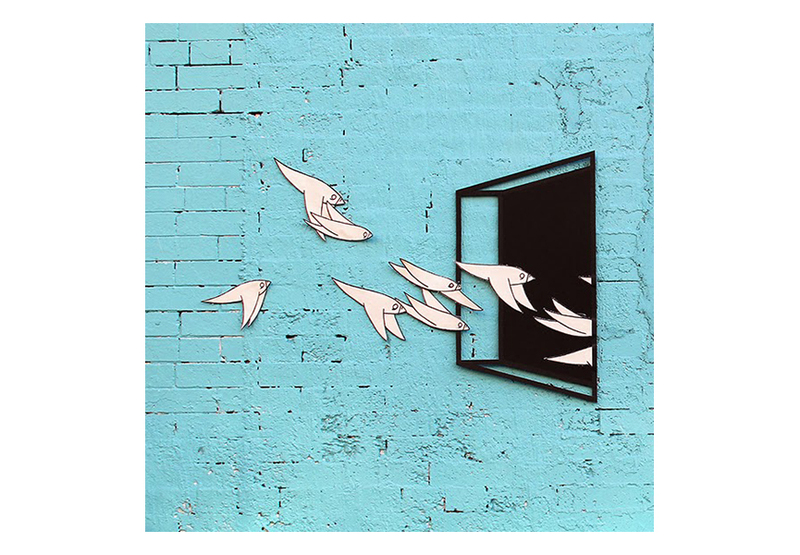 Know Hope painted doves flying through the illusionary window Aakash built. The doves seem to be flying in through the left window and out through the right. 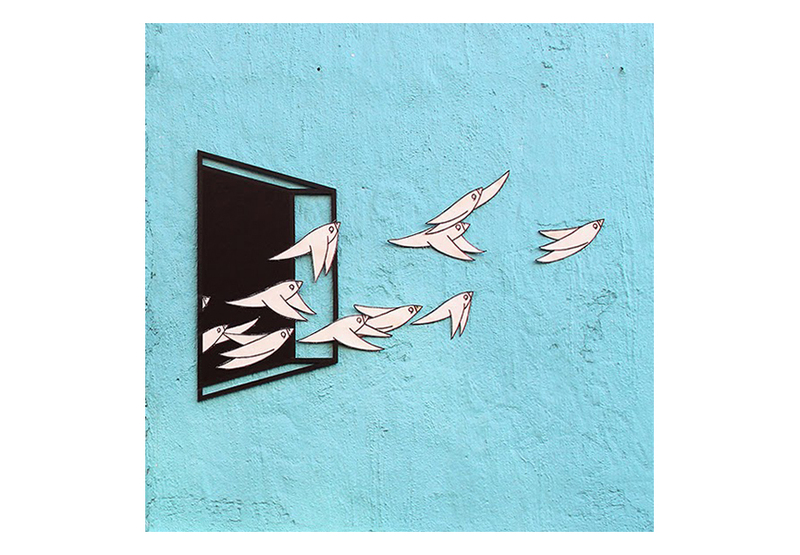 The doves are painted in the simple illustrative style of Know Hope and perfectly match the geometric aesthetic of Aakash Nihalani.